I’ve been looking forward to seeing Chef for quite some time now. It’s a return of form for Writer/Director and star Jon Faverau, as he returns to his roots of film making that are very similar to that of Swingers and Made. For the past few years, Faverau has been making tentpole after tentpole, with making the excellent first Iron Man film, the disappointing Iron Man 2, and the mixed result of Cowboys and Aliens. Chef is a much simpler film, with a micro-budget of only a couple million, and no special effects. But we still have a massive cast on hand, including Faverau, along with Faverau regulars Scarlett Johansson and Robert Downey Jr making brief appearances in the film. It’s an impressive cast and an interesting concept, so hows does Chef add up? Let’s dive in and find out. John Faverau plays Carl Casper, a renowned chef living in Los Angeles whose arguably past his glory days. He doesn’t have the freedom he use to have in the kitchen, as the boss of the restaurant he works at, played by Dustin Hoffman, doesn’t respect Casper. Casper has a young son, and an ex-wife played by Sofia Vergara. and one day after a bad review by a respected food critic played by Oliver Platt, Casper decides to quit his job. He then is able to acquire a food truck, and he enlists the help of his chef friend played by John Leguizamo, and his son, as they tour the south with their new truck. I’ll be completely honest in saying that I had more fun watching this film than I did with Faverau’s previous summer tentpoles, and I don’t that in a negative way against Faverau or this film. Faverau has made a really fun and enjoyable summer indie treat that I hope will start to gain more attention as the film continues to expand across the country. The film is funny, and sweet, and while it does have its sappy moments here and there, the film is always just a blast to watch, and the sequences of Faverau and his team on the truck is really fun and entertaining to watch. Faverau is great in the film, as well as Leguizamo who gives one of his best performances of his career, and there’s also some great work by actors like Bobby Cannavale and Scarlett Johansson, who is only in the film for a few scenes. Robert Downey Jr does a great job as usual, even though he’s only in one scene of the film, but it’s a scene stealer. Sofia Vergara is pretty good in the film, but she doesn’t have a whole lot to do in the film, as is Dustin Hoffman, but these roles are just primarily small supporting roles. What makes up for that is the vibe that the film has, as you can tell that everybody was having a blast making the film, and sometimes that fun on set doesn’t quite translate to the finished product (a la The Monuments Men), but that’s not the case with you film. You really enjoy the company of the characters for the most part, and it’s a fun and rewarding time at the movies. Easily the best part of this film is the chemistry between Faverau and his son in the film, whose played by a young actor named Emjay Anthony. He’s had some bit roles in the past, but this kid is really terrific in this film, and he brings a lot of the heart and humor to the film when it calls for it. The best part of the film are the sequences when Faverau and company hit the road, as they start from Miami and wrap up their road trip in California. You get some great sequences in Miami, New Orleans, and the last city they hit is my hometown, Austin, Texas. It was pretty awesome to see Austin on the big screen, and my friend happened to be in the area last summer when Faverau was shooting on South Congress, so we both thought that was pretty sweet. We get some nice appearances in the film by local hotspot Franklin’s BBQ and Austin’s own Gary Clark Jr makes a brief appearance in the film. And also, I strongly advise you to eat before this film, because I had just a snack before I drove to the theater, and I was in pain having to look at all of this incredible looking food on-screen, so if there’s a requirement I ask of you, see the film when you aren’t hungry, but I can assure you that you’ll probably end up getting hungry again after the film. 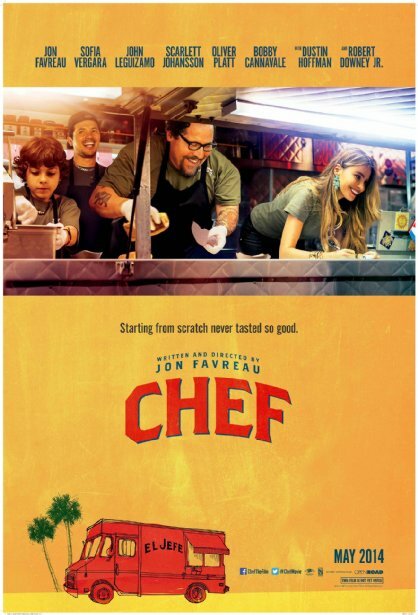 Like I said, the film does have its sappy moments, and even the ending was maybe a bit too sappy, but other than that, Chef is a lot of fun to watch, and I think it will end up being one of the highlights of this summer when you get all of the loud summer flicks out-of-the-way. If it’s playing in your area, it’s definitely worth checking out, as it’s a more than welcome return for John Faverau. It’s a shame that Faverau is going back to the tentpoles next year with the Disney retelling of The Jungle Book, but it’s Hollywood, one for the people and one for yourself. Hopefully after The Jungle Book, we get a film as fun and funny as Chef was, and hopefully not too far into the future.